Be Safe, Be Hands Free!! - Headsets Direct, Inc.
Be Safe, Be Hands Free!! For the last few years different states have been setting laws that will restrict drivers from using their handheld cell phones while driving. California State Law will take effect in July! Some states such as New Jersey are even banning the sale of hand held cell phones if they do not have a hands-free option. Kansas will fine $1,000 and a misdemeanor if they believe an accident was caused by the driver being on their cell phone. Right now is a good time to invest in a blue tooth or cellular headset before the law takes effect in your state if it has not already. Here are a couple of good options! 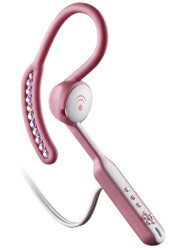 For the Diva, we have the Plantronics MIX M60 outfitted with genuine swarovski crystals. This over the ear headset is compatible with any cell phone that has a 2.5mm jack. It also has a boom-mounted microphone that allows for clear calls. Plantronics also offers the MX250 Headset which fits in the ear. It has a noise cancelling microphone that is great for cancelling out the noise of the wind while driving your convertible. It is compatible with all cellular phones with a 2.5mm jack.